Last Tuesday was rough. Really rough. As we analyze this election and start to hone in on the things that went really well, one of the brightest spots is the continued rise of the small-dollar donor. The increase in donations (98.3% growth compared to the 2012 cycle!!) is way higher than the growth in the number of number of campaigns and organizations using ActBlue (11.8% increase). Everyone’s raising a lot more grassroots money than ever before. It’s awesome. 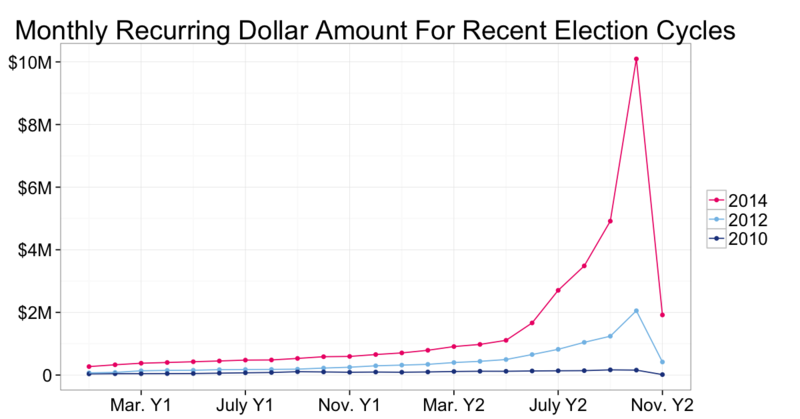 Keep in mind, the overall amount of money spent on Congressional elections is actually fairly stable compared to 2012. That means the overall share of money coming from grassroots donors on the left is increasing. The average contribution continues to drop, but not nearly as dramatically as it has in the past. 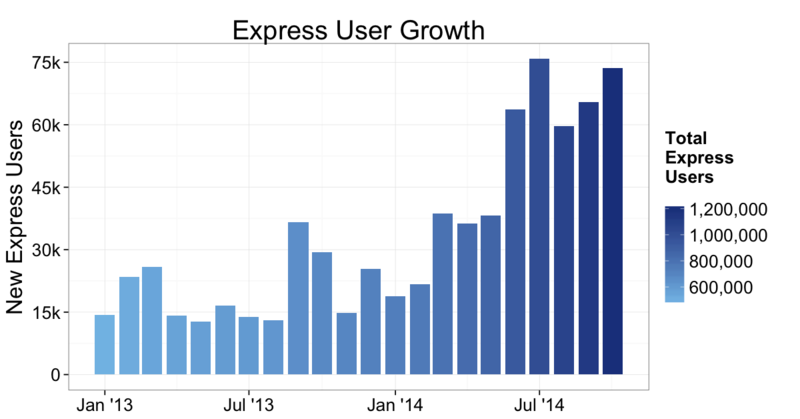 The Express user universe is simply massive at 1.2 million people with saved credit cards. It’s been growing at a steady rate all cycle, but has picked up steam since June 2014, averaging more than 67,653 sign-ups a month during the run-up to the election. Express users accounted for 53% of contributions this cycle, but in October they accounted for 59% of contributions. This is one trend we don’t see stopping any time soon. Express profiles lead to increased conversion rates and donors absolutely love the convenience of not having to re-enter their information. 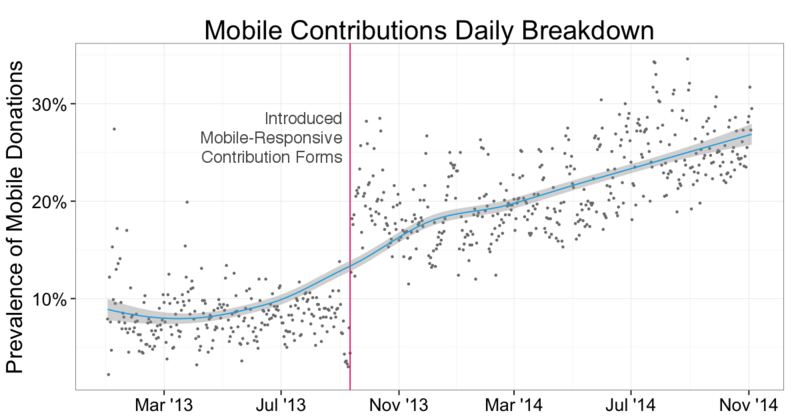 You’ll notice a dramatic spike when we rolled out our mobile responsive form in September 2013. We worked incredibly hard to decrease load time, even if we were shaving off mere fractions of a second, to boost mobile conversion rates. Read more here. These numbers will continue to climb, since more and more people are reading their email on their mobile devices. Smartphone adoption rates may have slowed, but usage is increasing rapidly. Going forward, it will be even more important to optimize your forms for mobile devices, which means sticking to best practices like keeping the amount of text on your forms down and making sure headers aren’t too lengthy. Nobody wants to have to type in a sixteen digit credit card number, let alone address/employment information, on a mobile device (no matter how big the phone’s screen is). That’s why Express is so important. All of these stats make us proud, but what’s the thing we’re most excited about? The growth in recurring. Look at these numbers! Recurring volume was up 241% over 2012. Even more eye-popping is the 461% increase in weekly recurring. That’s way more than the overall increase in volume that we’ve seen this cycle. We’ve been banging the drum for years about the potential of recurring donations, and this cycle is where we’re really seeing those recurring programs take off. Despite the bad news for Democrats this past week, there are dozens of organizations keeping up the fight and hundreds of candidates who did win. These groups will be around for years to come, and building a sustaining donor program is critical to their long-term success. And we’re just scratching the surface of potential growth. We saw recurring contributions spike to 13.7% of all money raised in August, which was amazing to see, but typically it’s much lower and it shouldn’t be. Sophisticated email programs should be targeting likely recurring donors and sending them only recurring asks. Off-years are the perfect time to be asking you list for sustaining money and building that pool of recurring donors. Internally, our team will be basing our 2015 goals on the number of people we sign up for recurring donations, and secondarily on the overall money we want to bring in. We’re optimizing for long-term sustainable growth. Record-breaking is really the only way to refer to this cycle for ActBlue. The biggest hour in terms of money was, shockingly (not), right near the end of the third quarter: 9/30/14 at 10 pm, when we processed a whopping $446,812.30. And the biggest hour in terms of the number of contributions processed was also during that end of quarter, when we processed 15,885 recurring contributions in a batch at 5 am. Yeah, that’s a lot. And really, it speaks volumes about our reliability. We had no significant outages or problems this cycle, and that’s our norm. Our uptime is 99.99%. This past year we had a total of 54 minutes of downtime from 33 instances. And the vast majority of those were planned outages for maintenance. We spent a ton of engineering time building our infrastructure to be able to handle 15k contributions in an hour, and it paid off. And our team is already at work preparing for 2016 and 50k contributions an hour, because it’s going to be so big that we might run out of superlatives. We’re excited to see what 2016 brings for Democrats, but until then, we’re going to keep working every day to build tools that uplift small-dollar donors and the campaigns that are powered by them. Note: We’ve made a change to how we tabulate the number of contributions made via ActBlue. Historically, we’ve only counted the first contribution made in a recurring subscription, mostly just because of how our database records this information. Now we will be counting each subsequent recurring contribution towards the total number of contributions. That’s how your dashboards calculate it already and this will keep things consistent.